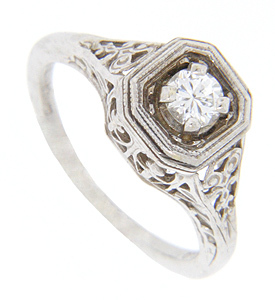 Intricate floral filigree decorates the sides and shoulders of this 14K white gold antique style engagement ring. Pairs of hearts are outlined on the ring’s sides. The central stone is a .26 carat G color Si clarity diamond that sits in an octagonal head. 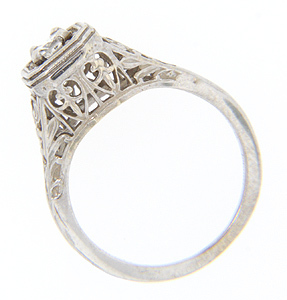 The ring measures 8.5mm in width. Size: 6. We can re-size.